Each year, the Krewe of King Arthur's 450+ members are best known for their afternoon parade on the first Sunday of Mardi Gras, commonly known as "family Sunday" in the Carnival schedule. The King Arthur parade strolls down beautiful St. Charles Avenue on the historic Uptown New Orleans route before turning onto Canal Street in front of tens of thousands of spectators of all ages. Dozens of marching units (floats, bands, etc.) make up the King Arthur procession. Prized throws include special beads for each King Arthur float. 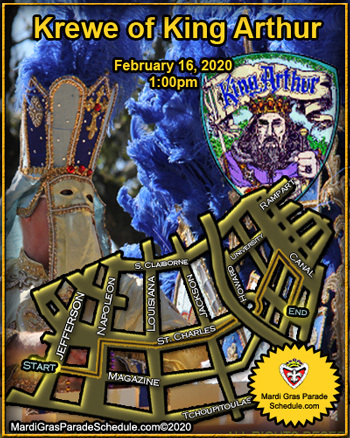 Mark your calendars now for Sunday, February 4, 2018 when King Arthur once again takes to the streets of Uptown New Orleans.! King Arthur is more than just a parade, however. The Krewe also holds its annual Bal Masque (masked ball) where King Arthur and Queen Guenevere are presented to fellow krewe members as well as the carnival community. Krewe members are active in local civic and charitable organizations. The idea of starting the Krewe of King Arthur began as early as 1971 in a classrooms of Ms. Adele Fisher and Susan Lavesseur at Marrero Middle School. Ms. Fisher taught reading and Ms. Lavesseur taught Math. Philip Fricano, Jr. and Carl Scivicque, Jr. (at the time both were 13 years old) were friends who tossed the idea back and forth about a new Westbank krewe. It was plain simple talking back and forth about how we could start a Mardi Gras krewe . The talks continued for several years. In their senior year of high school 1976 at West Jefferson High School, Philip became the editor of the yearbook and Carl was the associate editor. After searching past yearbooks, the two realized that the yearbook once hosted a Mardi Gras ball to raise money for its publication. Bingo!!! - - the two began hard work in getting permission from Mrs. Anite Currault to recreate the Krewe of Jean Lafitte annual ball. The ball had not taken place in almost 10 years. Each high school club sponsored a maid and duke and the scenery was borrowed from Ms. Thelma Gallico's dance school and the ball was a great success. The following Mardi Gras after graduation in 1977 Carl and Philip met by accident at the Krewe of Pegasus's parade and within two months, the club was incorporated. On April 12, 1977 the Krewe of King Arthur became a reality when Philip chartered the Krewe in Baton Rouge. Over the next few months, we met float builders, costume makers, realizing how in the world we would pull this off. Blaine Kern told me, "Listen son, you are never going to make this work, why don't you join the Krewe of Alla with the members that you already have." For the most part, I have a lot to thank him for. He gave me the "inside fire burning" and the "spirit" to make this happen. Across the street from Blaine Kern's den was the Krewe of Choctaw's den in which we met a man, Joe Ory who painted the floats for Choctaw. Joe was the float builder for Choctaw. He encouraged us to continue with our plans and he introduced us to the Captain of Choctaw, who was Mr. Godfrey Boudreaux. Mr. Godfrey gave us the deal of a lifetime. He told us to we could use as many of Choctaw's floats, as we wanted and pay the krewe when we could. He'd only charge us $500.00 per float. We used 10 floats and it took us 6 months to pay for the floats. The next step was to acquire a permit. The Krewe of King Arthur's first permit was issued from the City of Westwego, and with the help of Mr. Errol Jacobsen and his aunt Mrs. Edith Blanda we soon acquired the Jefferson Parish permit to roll on the 2nd Saturday of Mardi Gras.